There are two main characters in this very unusual children’s book. I included the excerpt about Leila to make it clear that there’s an international element to this book, even though both girls are Americans. One girl is having an overseas experience in Lahore, Pakistan, while the other girl is at her eccentric aunt’s house in a small town in Texas. Their connection – a very strange and magical book which is writing it’s own story. The best part of this children’s book is the ending. I never expected it, and the resolution unfolds so skillfully, that only at the end, did I realize the book contained a mystery to be solved. 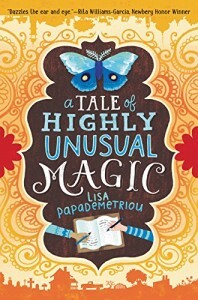 Leading up to the ending, the two stories of each of the girls, as well as the third story that the magical book is telling, creates a complex and interesting children’s book. It will require a good reader and sharp mind to stay with each story as it unfolds. Adding to that are the cultural references from Pakistan. None of these are drawbacks as much as they are defining factors for what young readers will benefit most from the book. It’s also important to note that this is a very girl-centered book. I don’t expect many young boy readers to resonate with it. On the other hand, there are lots of universal themes running through the story – music, nature, making friends, fitting in. Overall, a complex but worthwhile children’s book awaits the right readers.